Progeny Press has is one of our go-to curricula for literature studies for the big boys. Their study guides have been among the most thorough that we have found for the literature book itself, and also include a biblical application of ideas. While I am not generally a fan of Christian-based programs (mainly because I find they tend to espouse a perspective that often conflicts with our Catholic viewpoint), Progeny Press is one of the few studies with religious crossover that I do like. For this review, Jude got to do his first-ever, in-depth literature study and completed the Sam the Minuteman study. Reading the book was a little hard for Jude, because of its length. At a little over 60 pages and no chapter breaks, it was too much to read at one time. I had to skim ahead to find some natural transitions to the story to find places to take breaks. We read the book over three days, and then started into the literature review. 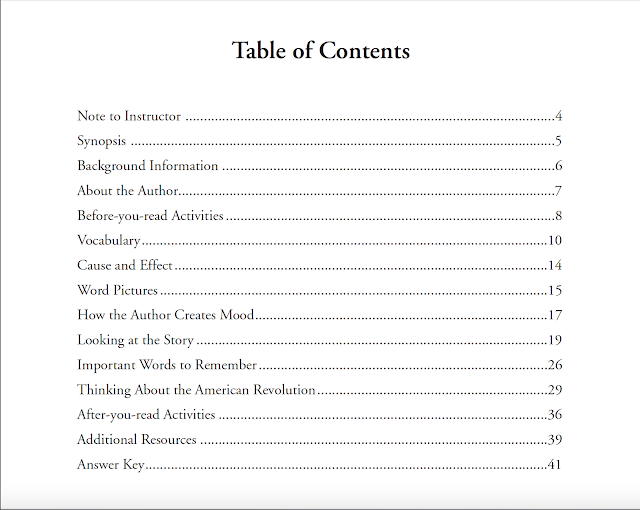 (There is a "Before You Read" section that puts the American Revolutionary War into a contextual timeline. We skipped over this because we were reading the book as a stand-alone literature work, but the study easily lends itself to being part of a larger unit study program.) Doing one section each day, it took us about two weeks of daily activity to complete the entire study. I really was impressed with this study because it was sufficiently in-depth to be thought provoking, but not so deep that it overwhelmed a young student. For example, the vocabulary words chosen for the student to define were ones that were a bit beyond Jude's normal language, but not so difficult that he couldn't figure it out from the context clues. (A student-level dictionary would be fine as well; no need for the Webster's Unabridged that resembles your college chemistry textbook.) Here we worked together -- he did the thinking, and I did the writing for the definitions in the first part, then he did the fill in the banks. Each of the sentences in this section was taken directly from the book. I liked how the program combines using the definition of the words in context with already-familiar passages. Jude completed the mystery word and definition himself. It then follows with a biblical tie-in. The big boys' guides have had not just verses to look up but then had critical thinking questions to go with them. I like that these younger ones focus more on exposure, rather than expecting them to really delve deeply into concepts. I've seen other Christian-based programs that want young students to stop and consider what Scripture is trying to tell them, and it's more than they're developmentally ready for. I really think this is a nice balance between a purely secular program and many others' almost bludgeon-ish Christian perspective. My only real complaint is that the guide does expect the student to look for specific passages in the book, and doesn't always give any guidance as to where he might find them. 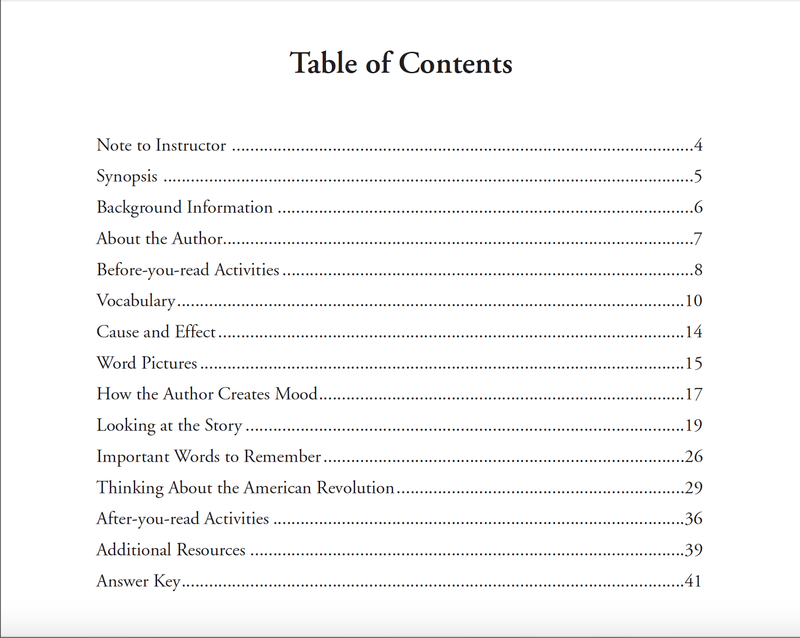 If it was a chapter book, then the guide could divide the questions by chapters (as the ones for older students do) giving a little bit of a landmark. Jude was often frustrated because he didn't know where he could find the answers to the questions. As far as I could find, only one question gave a page number; it would have been really helpful to have page numbers indicated with each question. I appreciated having an answer key included in the packet. It came in very handy during the "How the Author Creates Mood" section. Jude struggled with finding the "right" answer here. For example, for number 4, the statement was "When Sam and John saw the British soldier waving his sword and shouting at them, they felt... a) confused b) annoyed c) shy." The "official" answer was confused, but Jude didn't understand why they were confused. I see his point. In the story, Sam says, "I'm dispersing as fast as I can...he doesn't need to shout." Jude thought the boys were annoyed at being yelled at when they were already leaving. I think this is where "I love homeschooling" comes to play. On paper, he was wrong, but he explained his answer so I gave him credit for it. Issues like this wouldn't keep me from using the program, but I would be more inclined to do sections like this with Jude, as opposed to a more black-and-white vocabulary section. There are several activities for after you've completed the book and study. Some are writing related - writing a journal from another character's perspective, or a story sequel. There is also an arts/history project, making a three-cornered hat, and a science butter-churning activity. 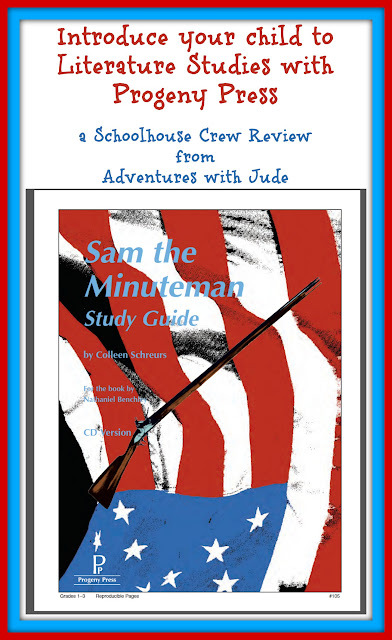 There is also a page of additional resources containing books written by the Sam the Minuteman's author Nathaniel Benchley, as well as related titles by other authors set in the same era. Combined with the pre-reading activities, you could easily turn this into a full unit study on the American Revolution. I'm really impressed with this study, both as a teacher and a parent. Wearing my teacher's tricorn, I think it's an age-appropriate introduction to literature study; it provides a very solid framework for studying a book but isn't overwhelming. Turning my tricorn to the parent side, I was very happy that it was something Jude found he could do. There were a few rough moments where he had to put forth more effort because it was new, but he was really excited to read the book himself and be able to comprehend it. He's happy that now he can move on to "big kid work" like his brothers do, and not be stuck with "baby stuff" like Damien. Progeny Press has yet another reason to be our family's go-to Literature Study resource.